Thick clinging formula for prolonged contact times without spreading. 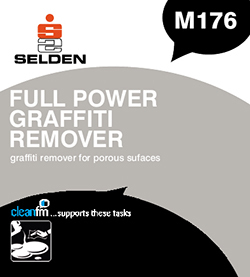 Quickly penetrates all types of grafitti, including permanent marker & spraypaints. Blisters spray paint for ease of removal with minimal ghosting. Ideal for removing grafitti from brickwork, breezeblock, sandstone and any solvent resistant surface. NB Not suitable for use on solvent sensitive surfaces such as plastics & polycarbonates. Removes all paints, including basecoats. Paint on using a solvent resistant brush, leave for 30 minutes to 4 hours (more porous surfaces require longer). Agitate with a stiff brush, if required and for best results (to prevent bleeding or ghosting) the best technique for removal is pressure washing with water. Alternatively, remove by scraping. On non-porous surfaces, such as metal, the grafitti can be wiped off with paper towel.